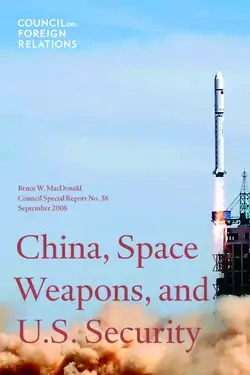 China’s successful test of an anti-satellite weapon in 2007, followed by the U.S. destruction earlier this year of an out-of-control U.S. satellite, demonstrated that space may soon no longer remain a relative sanctuary from military conflict. As the United States, China, and others increasingly benefit from the information that military and intelligence satellites provide, the temptation to attack these satellites provides troubling potential for instability and conflict in space that could dramatically affect U.S. military capabilities on earth. In this Council Special Report, Bruce W. MacDonald illuminates the strategic landscape of this new military space competition and highlights the dangers and opportunities the United States confronts in the space arena. He recognizes that advancing technology has likely made some degree of offensive space capability inevitable but calls on the United States to draw upon all instruments of U.S. power, including a reinvigorated space diplomacy, to lead in establishing a more stable and secure space environment. To this end, he spotlights a series of pragmatic policy, programmatic, and diplomatic steps the United States should take to strengthen its security interests in space and help reduce the chances that the military benefits of space will be cut off when the United States may most need them. In addition, these steps would serve important U.S. and Chinese economic interests and open new channels of communication and understanding between the mid-twenty-first century’s likely two leading powers. This timely report breaks new ground in thinking about the space dimension of U.S. security interests and its growing effect on U.S. security in the twenty-first century, and will be especially useful to those who are unfamiliar with the role of space in U.S. security.